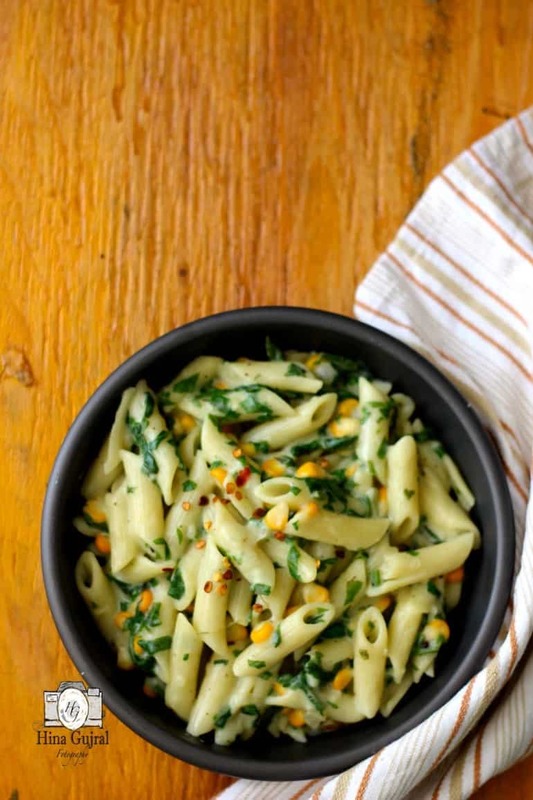 Spinach Corn Pasta is a great wholesome dish laced with the goodness of spinach and cooked in the whole wheat white sauce. This spinach Corn Pasta is hands down the clear winner when it comes to dishes which are equally healthy and tasty. Loaded with the goodness of spinach and cooked in whole-wheat white sauce (yeah! It’s possible to make a white sauce with whole-wheat flour), this pasta is as fulfilling as it can be. This pasta recipe is one of my go-to recipes on the busy working days. There are certain apprehensions about pasta being unhealthy food but if cooked in a right way with vegetables and along with whole-wheat sauce it makes it wholesome. It is also important to know the kind of pasta you need to buy, always look for whole wheat pasta, as these have higher nutritive value. The idea of using whole-wheat flour for the sauce was suggested by a friend’s mom, who is an expert homemaker. The whole-wheat flour not only provides healthy dimension to the white sauce but also create a creamy textured white sauce. I couldn’t resist the idea of making an everybody’s favorite dish with a healthier replacement. 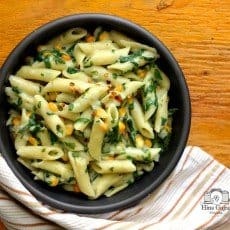 For this pasta recipe, I’ve used corn and spinach, but to break the monotony, you can do tons of experiments with it and add the vegetables of your choice. 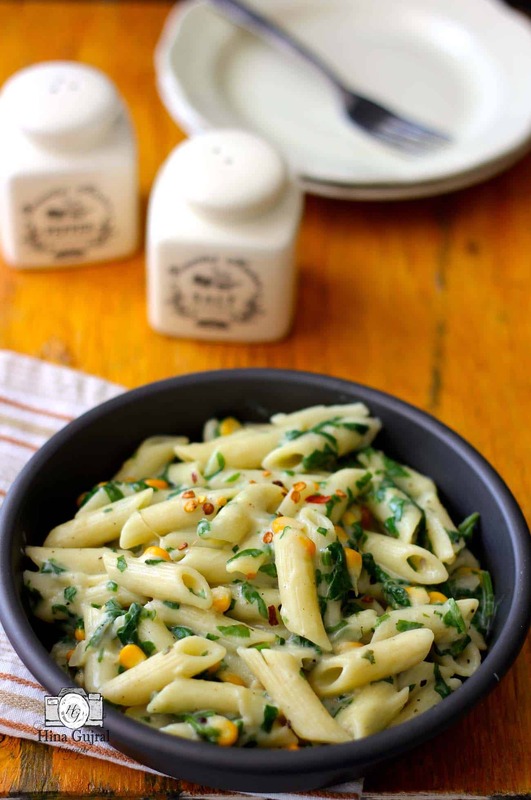 For our weekend dinner we pair Creamy Spinach Corn Pasta with toasted whole-wheat garlic bread and a summer salad and of course not to forget a glass of chilled white wine. 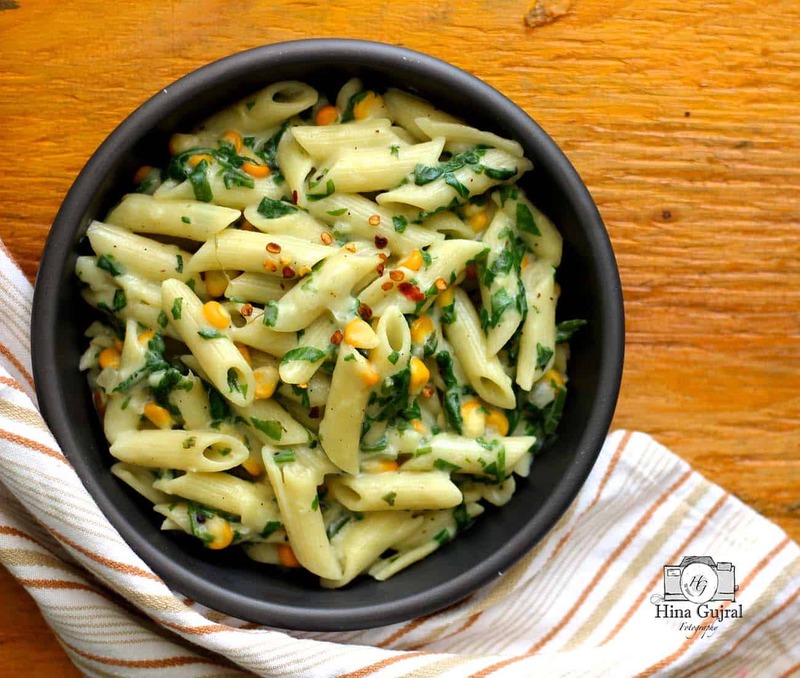 Spinach Corn Pasta is a great wholesome dish laced with goodness of spinach and cooked in whole wheat white sauce. To make Spinach Corn Pasta, we will first cook the pasta. Heat water a large pan on high heat. Once the water comes to a boil, add the pasta and salt. Cook until the pasta is al dente or cooked as per your liking. Once cooked, drain the water, preserve some of the water to flavor the sauce and rinse the pasta with cold water to stop the cooking process. To make the pasta sauce, whisk the milk, wheat flour, black pepper powder, and salt. Stir until there are no lumps. Next, heat a tablespoon olive oil in a saucepan (buy it here) over medium heat. Add chopped onion, garlic and saute for few minutes, until you smell the aromas coming through and the onions have softened. Pour the milk mixture into the sauteed onion and keep stirring continuously to cook the sauce. Keep stirring until the sauce thickens and has cooked through. Cook the sauce on medium heat, so the sauce thickens gradually with no lumps. If the sauce is too thick, you can add reserve boiled pasta water or more milk to get the desired consistency. Add the grated nutmeg and stir to combine. Turn off the heat. Our next step is to cook the spinach. Heat a tablespoon of oil in a wok over medium heat. Add the spinach and corn and cook until the spinach has wilted down. This will take about a minute. Add the pasta to the cooked spinach and give it a stir. When you are ready to serve, combine the sauce along with the spinach pasta and give it a toss in the wok. Check the salt and spice levels and adjust to suit your taste. It is important to mix the sauce to the pasta only when you are ready to serve, so the pasta tastes fresh and does not become sticky and gooey. Sprinkle chili flakes and oregano before serving. Serve the Spinach Corn Pasta in Whole Wheat White Sauce along with warm garlic bread for a weeknight dinner.